Glasgow North West MP Carol Monaghan has presented her petition to stop the closure of the Drumchapel Post Office to the House of Commons (Tuesday April 25th 2017). The petition, which was set up after the closure was announced in January, has garnered significant local attention and over 1,000 online and physical signatures. Speaking earlier today in a Westminster Hall debate on Post Office closures, Monaghan said that the impact of the closure would be “devastating to the local community”. “I am pleased to present the petition to the House of Commons, signed by over 1,000 of my constituents, concerned about the devastating impact the closure of the Drumchapel Post Office will have on the local community. “Having visited the Drumchapel Post Office a number of times over the last few months, it is clear that local residents will find it difficult – and for some disabled people impossible – to travel to the nearest available Post Office. 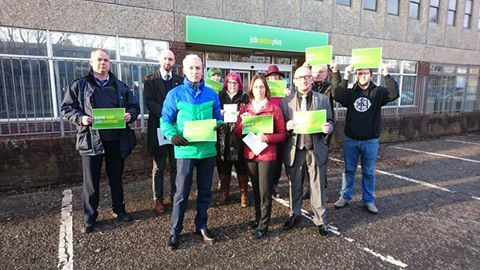 “Whilst the Post Office have said that they are hoping to relocate to a smaller counter, perhaps within a shop, I remain concerned about the retention of the current hard-working staff, and the potential change in pay and conditions they may be subject to. “Furthermore, this would ultimately lead to a massive reduction to the full range of services offered at the current office, such as Passport Check and Send, Document Certification and Verification Services which are not available in nearby integrated counters.